President Park Geun-hye on Wednesday presided over a national science and technology strategy session to discuss future growth dynamos and ways to breathe fresh life into the country's economy. During the session that followed the inaugural one in May, the panel selected nine strategic projects aimed at securing the nation's new growth engines and enhancing the quality of life for the general populace. The panel designated autonomous vehicles, light materials, the smart city model, artificial intelligence and virtual reality as the sectors for future growth, while choosing fine dust, carbon resources, precision medicine and new drugs as the sectors for the improved quality of life. 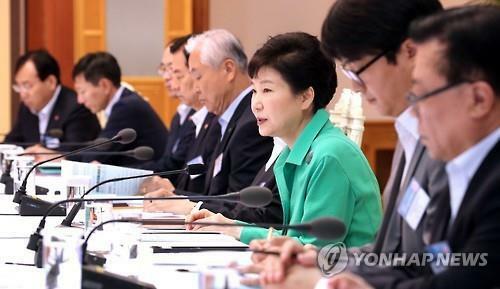 Park stressed that South Korea would foster these sectors through close public-private cooperation. The conference was held as the Seoul government is striving to cope with the fast-paced industrial transformation, dubbed the "fourth industrial revolution" characterized by a fusion of cutting-edge technologies, such as big data and the Internet of Things. "Ahead of the sea of change in the global market, which is being triggered by the fourth industrial revolution, what is at stake is national competitiveness and jobs for young people," the chief executive said during the session, which was attended by some 40 senior government officials, leading experts and scholars. "With this in mind, I cannot just sit back and relax." In the era of the new normals represented by "low growth, low prices, low interest rates," South Korea should take prompt, timely steps to enhance its national competitiveness, the chief executive emphazied.